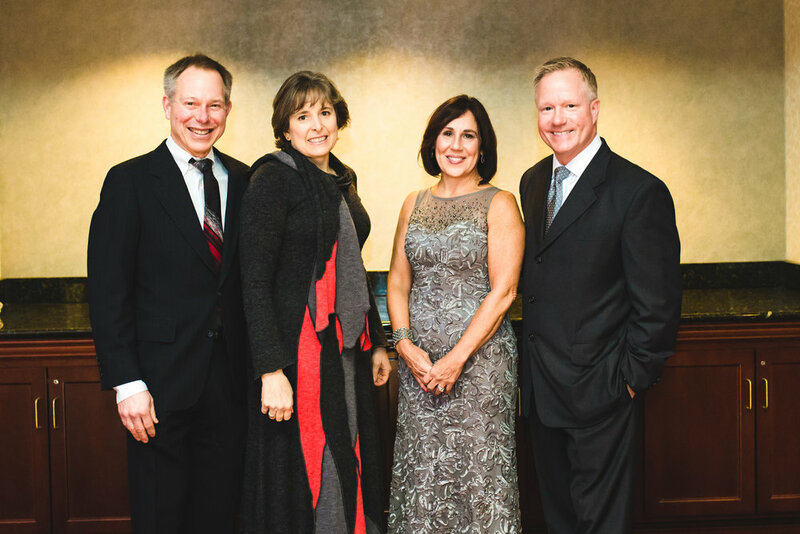 This fall marks the 5 year anniversary celebration of the Investor Property Partner Program, launched back in 2013 by two pioneer investor couples; Dave and PeggyShumway and John and Ginny Opsahl. Both couples generously rent apartments or townhouses that they own back to Fellowship Housing at a reduced rate for use by our single moms and their children. Photo from 2016 Fellowship Housing Gala. From left to right; David and Peggy Shumway, Ginny and John Opshal. Ginny Opshal is the one who originally presented the Investor Property Partner idea, birthed out of her real estate knowledge and business when she asked the question, “What’s this ‘housing’ part of Fellowship Housing?” and subsequent conversation, also with Brooke Bartlow. (Surely some divine timing was at play with these couples asking the same questions at the same time!) Ginny is able to keep an eye on the market for properties to utilize as well as assist moms in securing their own home to purchase or rent upon graduating the program. John is on the Food for Friends board, which you may know is a long-time partner of Fellowship, giving moms in the program grocery funds and teaching them how to shop on a budget, as well as generously providing them with Thanksgiving meals each year. Ginny, right and son, Ben, left, run their family ReMax Business together and are also annual hole sponsors for the Fellowship Housing Golf Outing. Their desire to help the moms of Fellowship Housing runs deep with this eternal perspective in mind. They are grateful to be a part of keeping operating expenses down for the program and find joy in giving the moms a vision and hope through providing them the type of home now which they will be able to rent or own themselves once they graduate. Recently, another investor joined and the model looks slightly different still as they own several apartment complexes and have generously rented to Fellowship Housing at a very reduced rate. This new partnership has allowed Fellowship to extend its housing options into Elgin, an area with great levels of poverty and need for its largely Hispanic population. While different strategies may work for different investors, each one provides a life-changing opportunity for another homeless or at-risk single mom and her family in our community. Some of these investor properties even provide a third bedroom, allowing Fellowship Housing to help the occasional mom who comes to us with more than three children (more than can live in Fellowship’s typical 2-bedroom apartment format). Investor Properties can also provide some expanded amenities that most of us take for granted, like a garage or in-unit laundry. For all of the ways that our Investor Property Partners are making a difference, we truly thank you and celebrate this 5 Year Anniversary! If you’re interested in learning more about the Investor Property Program or would like to get involved, please contact Pamela@fhcmoms.org.